If you have a cavity that requires a filling, you can visit our regular cavity filling page. 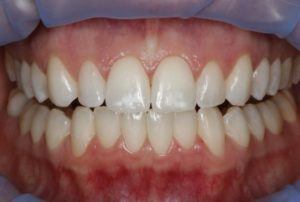 Patients always have the option of going with a tooth-colored composite filling as opposed to the traditional amalgam (silver-colored fillings). In general, dentists are placing white composite fillings more frequently now. But, the color of the filling is not what makes a filling a cosmetic filling or not. The main difference is for insurance purposes, and it all comes down to whether the filling is an elective procedure. What makes a filling cosmetic? There is no difference in the material or quality of a cosmetic filling vs a regular filling. The difference is how insurance classifies the filling. Regular Filling: This is a filling done because of tooth decay. Cosmetic Filling: This is an elective filling that improves the aesthetics, or look, of a person’s smile. The reason this is important for you to understand is that most insurance companies will not cover cosmetic fillings, but they will cover all or a portion of regular fillings. NOTE: Most insurance companies will provide coverage on the replacement of an amalgam filling that is beginning to fail. If you have an amalgam filling and would like to find out if your insurance will cover the replacement with a tooth-colored composite filling, please contact our office for more information. 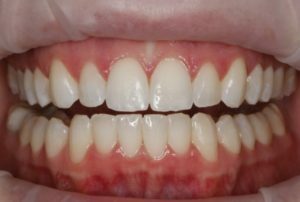 Can You Cover Up White Spots On My Teeth? If this picture looks familiar to you, you have what is called “white spot lesions” on your teeth. Dr. Browne is very experienced at fixing this issue by doing small cosmetic fillings out of a composite “tooth-colored” filling that matches the exact color of your teeth. If you are interested in a cosmetic filling, please contact us, and we can schedule an appointment to develop a plan of care. In the meantime, you can navigate back to our general services page or call our office at: (406) 442-0282.